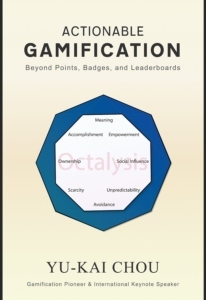 In one of my previous book reviews, I argue that Gamification is becoming every day more common, however, many implementations are not as successful as others. I have seen many gamification projects that keep users engaged for a very little time, probably just while the new product is still fresh and users are curious about it. But designing a gameful solution that is able to keep motivation and engagement in the long-term is not as easy as it seems. Yu-kai Chou is a pioneer and leader gamification expert who is gathering experience and teaching how to design better gamified solutions since 2003. His book Actionable Gamification: Beyond Points, Badges, and Leaderboards is a thorough compendium of practical advice on how to build great gamified products. The book’s content centers around the Octalysis Framework, Chou’s own set of guidelines for Human-Focused Design–a name that he often uses instead of Gamification to emphasize the difference from Function-Focused Design. 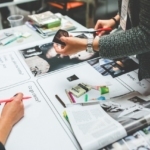 While Function-Focused Design, the paradigm that was common before the recent rise of Gamification, focuses on building efficient systems to carry out specific tasks, Human-Focused Design “optimizes for human motivation in a system”, according to Chou. Therefore, the Octalysis Framework aims to help designers understand what motivates the human being and how to design systems that optimize this motivation towards the accomplishment of the system’s goals. The Octalysis Framework presents eight Core Drives, which represent different types of motivations. Chou suggests that any human action only occurs when one is motivated by one or more of these Core Drives. He also suggests that if none of these Core Drives are present behind an action, no behaviour will happen. Therefore, to begin mastering the Octalysis Framework, the designer must learn to analyse any system through the lens of these eight Core Drives. 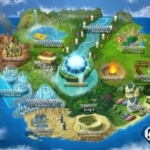 Subsequently, they must learn how to apply design elements (or game mechanics) that appeal to these Drives and thus motivate users towards the desired actions. Loss & Avoidance: the motivation to avoid something negative from happening. Along the book, Chou explains each one of these Core Drives in details, teaches how to identify them in practice, and presents some Game Mechanics that can be included on a design project to appeal to each Core Drive. In addition, the book presents two images that help to understand how the Core Drives work, relate to each other, and support motivation. The first image is that of Left Brain or Extrinsic Drives vs Right Brain or Intrinsic Drives. Left Brain Drives (2, 4, and 6) are related to extrinsic motivation, so their motivations arise from something that the user will gain from the action, while Right Brain Drives (3, 5, and 7) are related to intrinsic motivation, so they help make the action enjoyable by itself, without the need of external motives. The second image is that of White Hat vs Black Hat Gamification. White Hat Drives (1, 2, and 3) are considered positive motivation, so they often make the user feel good, while Black Hat Drives (6, 7, and 8) are considered negative motivation, so although they are effective in motivating users to take specific actions, they might feel bad after that. 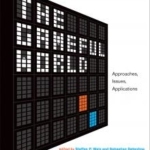 Nevertheless, Chou argues that Black Hat Gamification is not necessarily to be avoided, but it should be used with care to avoid leading to negative feelings that will keep the user engaged for a short time, but will ultimately become too unpleasant and will drive them away. After explaining the Core Drives and how to apply them in practice, Chou goes on and provides an overview comparison of the Octalysis Framework with some of the other well-known Gamification frameworks. He then closes the book with a few more examples of employing the Core Drives to analyse existing systems and uses his own blog as an example of how to design a Human-Focused System from the beginning. Actionable Gamification provides many insights and practical guidelines that can really help designers improve their knowledge and ability to design great Gamified solutions. I recommend the reading for anyone who is serious on becoming a good designer and is willing to put effort into learning and practicing. However, the book is not aimed to be a “beginner’s guide” to Gamification, nor does it intend to guide someone on their first steps onto the field. Chou’s theories and explanations are clear and precise, but profound. For someone who is just beginning, perhaps the best way to make the most of this book is to first learn some basic Gamification concepts and try to design a few simple solutions (and if you need a suggestion, please read this other review), then go through the Octalysis Framework to learn how to improve as a designer and how to avoid common mistakes. That being said, I feel I would have liked to read more about defining the goals, actions, and user motives behind a great system, which were not addressed as deeply as the motivational factors of the Core Drives. The definition of goals and actions is a crucial factor of success for any system, including Gamified systems. At the end of the day, users really need to get what they want from the system. If gamification is employed to keep the user engaged with a system that does not provide real value, it will probably lead to frustration on the long term. If gamification is used to motivate users into doing actions that might not be the best for them in the long term, the implications can also be complex. It is not that these topics are not mentioned in the book. For example, Chou shows the importance of defining the goals and actions before actually thinking on the Core Drives when he presents the example of designing his own blog. He briefly mentions the ethical implications of Human-Focused Design and how he turned down possible clients because he believed the system would lead people to take actions that would not be healthy. However, the focus on these points is not so strong as the focus on the Core Drives, and they are not discussed as thoroughly. The book also mentions how the Desired Actions represent an important part of the design but does not elaborate on what are and how to design these desired actions. Moreover, there is little reference on how to apply all these concepts into one’s own life goals instead of enterprise systems. I suspect the reason for leaving these topics out of the book is that the author ran out of space, as he mentions that he had planned more content originally, but decided to split it and plan for future books. I am looking forward to seeing how these topics will be addressed in future publications. Octalysis Media, 509 pp., April 2015. 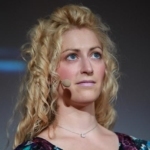 Gamification vs Gameful Design: why does it matter?